1 4 • O U T PA T I E N T S U R G E R Y M A G A Z I N E • J A N U A R Y 2 0 1 9 I f you casually ask people about their digestive health, you're bound to get some funny looks. But ask people whether they have a problem with heartburn, and many will answer affirma- tively and emphatically. 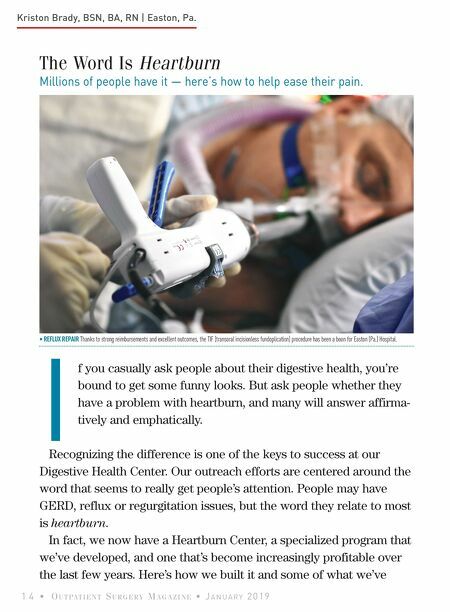 Recognizing the difference is one of the keys to success at our Digestive Health Center. Our outreach efforts are centered around the word that seems to really get people's attention. People may have GERD, reflux or regurgitation issues, but the word they relate to most is heartburn. 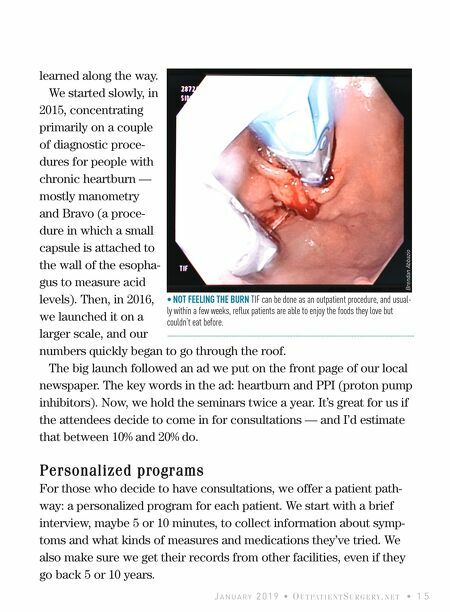 In fact, we now have a Heartburn Center, a specialized program that we've developed, and one that's become increasingly profitable over the last few years. Here's how we built it and some of what we've The Word Is Heartburn Millions of people have it — here's how to help ease their pain. Kriston Brady, BSN, BA, RN | Easton, Pa. • REFLUX REPAIR Thanks to strong reimbursements and excellent outcomes, the TIF (transoral incisionless fundoplication) procedure has been a boon for Easton (Pa.) Hospital.